Diving to make his crease as Tyrone Kane tried to throw down the stumps, Imam - nephew of Pakistan great Inzamam - collided with the onrushing wicketkeeper Niall O'Brien. As luck would have it, Pakistan staged the second fight back, and this time they really did show stomach for the fight as Shadab and Ashraf stitched together an unbeaten 109-run stand for the seventh-wicket before the rain arrived and curtailed played by eleven overs. 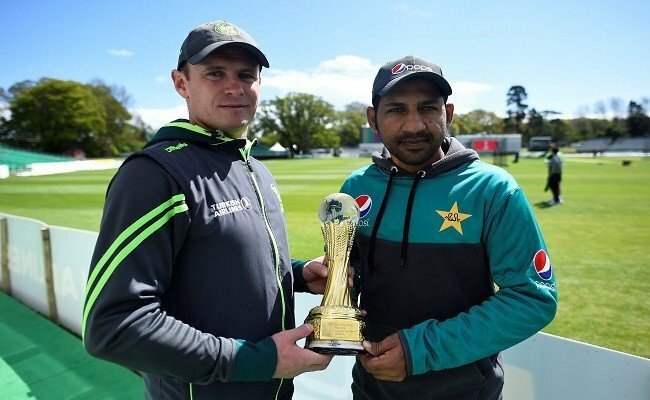 Azhar Ali (4) became Rankin's first Test victim as the quick also claimed the first Test wicket for Ireland when William Porterfield caught the opener in the gully. Ireland were awarded Test status previous year by the ICC and it was confirmed in October that Pakistan would be the first opponents for the new boys. Azhar Ali faced the first ball of the match from Tim Murtagh and kept out a yorker before calling his opening partner through for a single. A downpour prevented any play on Friday, making the rookie hosts wait another 24 hours before starting their Test careers on an entertaining day in Dublin. Ireland's long-awaited Test match debut was delayed by the elements yesterday, with the first day of their historic contest against Pakistan washed out. Shafiq square-cut Kane for four, with left-hander Haris glancing Thompson for a legside boundary. Porterfield used all five of his seam bowlers before lunch but it was Paskistan that carried the momentum, going in on 67 for two with Haris on 28 and Shafiq 22. Babar Azam (14), pushing hard at a Murtagh delivery that left him off the pitch, was well-held by Paul Stirling at second slip. Rankin eventually tempted Shafiq to pull to square leg on 62, giving him, Murtagh and Stuart Thompson two wickets apiece. But Khan, batting lower than usual, and allrounder Ashraf, on debut, began a recovery before tea in the grounds of Malahide Castle, just north of Dublin.